Because not only in summer t-shirts are cool, I already have some in my list in order to renew my collection. As I’m sure you are, also I’m quite a huge t-shirt fanatic. If in the past I used to put all my t-shirt aside as soon as the summer ended, now with the layer trend we can use our t-shirts every season. 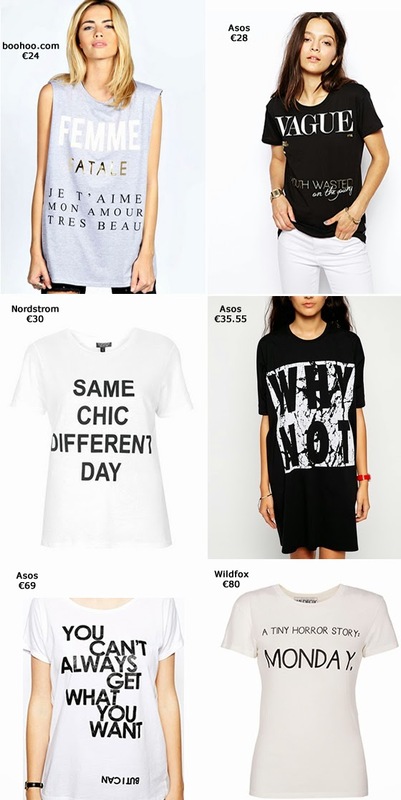 I love graphic tees but the slogan ones are my favorite right now. É que não há forma de eu me cansar destas t-shirts :D Ainda hoje estou com uma! E acho que vou ter de ir comprar a primeira da Zara!